The BBC's new Acting Chairman Lord Ryder also apologised "unreservedly" for errors during the Dr Kelly affair. Mr Dyke's departure came 20 hours after BBC Chairman Gavyn Davies resigned following the Hutton Report and after the governors spent Thursday morning in crisis talks in London. An emotional Mr Dyke told BBC staff at their central London headquarters: "I don't want to go. But if in the end you screw up you have to go." 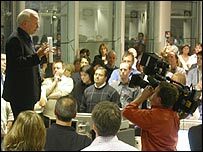 In the wake of his resignation there were spontaneous walkouts at BBC offices in Birmingham, Manchester, Newcastle, Glasgow, Cardiff and Londonderry. Staff at BBC Somerset Sound walked out and the station aired a minute of silence in protest. Mr Dyke told around 1,000 people outside Television Centre he was not "a political animal" but he hoped the two resignations meant "a line can be drawn under this whole episode". He said his sole aim had been to defend the BBC's independence and "act in the public interest". Later, asked whether he was sacked by the BBC governors, Mr Dyke said he had offered his resignation on Wednesday night. "After that it was up to them," he said. It is understood the governors voted by 2-1 to accept his resignation. Mr Dyke said he "could not quite work out" what the governors had apologised for. The BBC had made certain mistakes, he said, adding: "I do not necessarily accept the findings of Lord Hutton." The pair quit after parts of Andrew Gilligan's BBC reports of claims Downing Street "sexed up" a dossier on Iraq's illegal weapons were branded "unfounded" by Lord Hutton. Lord Ryder said: "The BBC must now move forward in the wake of Lord Hutton's report, which highlighted serious defects in the Corporation's processes and procedures. "On behalf of the BBC I have no hesitation in apologising unreservedly for our errors and to the individuals whose reputations were affected by them." Prime Minister Tony Blair quickly welcomed the statement, saying it meant both the BBC and the government could move on. He said: "This for me has always been a very simple matter of an accusation that was a very serious one that was made. It has now been withdrawn, that is all I ever wanted." Mr Blair said he respected the BBC's independence and expected it to continue to question the government "in a proper way". 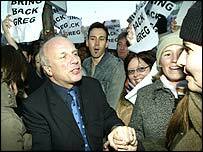 The apology was also welcomed by ex-Number 10 media chief Alastair Campbell, who told BBC News 24: "It was right that Gavyn Davies has resigned, it's right that Greg Dyke resigned." Lord Hutton's report cleared the government of "sexing up" its Iraq weapons dossier with unreliable intelligence. He criticised "defective" BBC editorial controls over defence correspondent Andrew Gilligan's broadcasts on the Today programme. Leaving after four years in his post, Mr Dyke said his position had been compromised by Lord Hutton's criticisms of BBC management. Former BBC journalist Martin Bell paid tribute to Mr Dyke: "He revived the confidence of staff, he was an inspirational leader and his departure is a serious blow to public sector broadcasting." Mr Dyke's deputy, Mark Byford, has been appointed as acting director general until a successor is chosen. The departure of both the BBC chairman and director general comes amid growing calls for the BBC to come under outside regulation. Culture Secretary Tessa Jowell said the Hutton report would be taken into account in the 2006 review of the BBC's charter. In his resignation statement, Mr Davies said that as the man at the top he had to take responsibility. But he questioned whether Lord Hutton's "bald conclusions" on the dossier's production could be reconciled with the balance of the inquiry's evidence. In his long-awaited report, Lord Hutton said he believed Dr Kelly had killed himself after being named as the suspected source of the BBC's controversial weapons dossier story. Dr Kelly's family has urged the government to learn from their tragedy. In a separate development on Thursday it has emerged Lord Hutton will be grilled by a committee of MPs over the role of inquiries into government. The retired judge has also ordered an urgent investigation into the leak of his findings to the Sun newspaper. "One of the most turbulent days in the BBC's history"
"In the end, this is about trust"